Elisa dressed as a Hormel Girl. Minnesota’s Ordinarily Unsung Concert is an award-winning concert series about unsung, unique, and unusual people in Minnesota history. The Minnesota Sesquicentennial Commission commissioned award-winning songwriter and student of history to create Minnesota’s Ordinarily Unsung concerts and workshops to celebrate Minnesota’s 150th anniversary as a state. 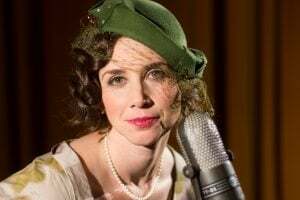 Ms. Korenne is gaining a reputation for her songs about characters and events that are too fascinating for the history books, and she has mastered the art of telling those untold stories from the stage. Since moving to Minnesota from New York City, Ms. Korenne has focused her sharp musical storytelling on characters from Minnesota’s past. Minnesota’s Ordinarily Unsung Concert is the first Minnesota-focused project in the national Ordinarily Unsung project created by Ms. Korenne, which has received support from the Jerome Foundation, the Ucross Foundation, the Hedgebrook Foundation, the New York Mills Regional Cultural Center, and the Minnesota Sesquicentennial Commission. Minnesota’s Ordinarily Unsung concerts are feasts for the ears and the soul. They inspire audiences with musical character studies and narratives that feature Elisa’s warm, rich voice, and they are interspersed with Elisa’s characteristic humor and love for audience participation. Concerts and workshops can be combined into multi-faceted historical events. You can hear samples from the live concert by pressing play on the music player below.